Thanks for the hard work on this - as someone who both software instruments and audio effects in real-time, it's good to have some actual data on what interfaces are high-performing. It's interesting that the Mackie Onyx Blackbird ranks higher than several of RME's interfaces. Considering the Mackie is definitely a lower-end interface, should I be cautious of extrapolating its low-latency performance to mean that it's a high-performance interface in general? Said another way, should I expect that its low-latency driver performance indicates that it would also be a stable interface for live use? The Mackie benefited from the improved version 4 driver from TC applied for their Dice FW solution, also used by Presonus/Focusrite). You will notice all of them perform equally. It achieved a higher LLP rating because it has measurably lower RTL due to the low latency AD/DA being used. Its a solid performer, there should be no problem using it live IMO. This Japanese testing site has some more USB3/2 RTLs for the Zooms (just scroll down for the tables and CEntrance test screens in English). Well according to the Centrance results across USB3 and USB2 @ 24 and 128 / 44.1 , the results were identical, at 32 / 96 there was 24 samples less on USB3 ? So any measured value/variance of less than 0.5ms may not actually be accurate/significant. Still, even allowing for a 0.5ms inaccuracy, those reported RTLs do look quite respectable for any AI, and moreso for an USB AI. FWIW, I'd venture that Zoom are using CEntrance developed drivers for those USB3 AIs, as they've used CEntrance drivers for a number of their previous product offerings. What surprised me was that the Zoom driver offered a 24-sample buffer setting (8-sample granularity?). So any measured value/variance of less than 0.5ms may not actually be accurate/significant. "I found RTL simplicity itself to use, and it provided results that were repeatable within a sample or two at most, thus ensuring latency measurements accurate to a small fraction of a millisecond." Indeed, that was regarding Andrew's then-new (Oblique Audio) "RTL" utility which you were therein reviewing. But in the immediately preceding paragraph, regarding CEntrance's "LTU" (to the inaccuracy of which my post you quoted referred), you'd stated that "...it did prove a little fiddly to get reliable results". Admittedly, it was hardly necessary for me to point out the accuracy level of CEntrance's LTU to Vin or Pete, as DAWbenchers they were already well aware-- my purpose there was simply to inform those unaware. Now, feel free to retract that tongue before I'm obliged to start in about the, ahem, "reliability" of Rightmark's Audio Analyzer utility! ...before I'm obliged to start in about the, ahem, "reliability" of Rightmark's Audio Analyzer utility! No, no... you go ahead, I've got the popcorn and everything. Goddard wrote: What surprised me was that the Zoom driver offered a 24-sample buffer setting (8-sample granularity?). The real question is whether its just window dressing or actually usable. The delivered I/O and RTL has little relevance if the driver is inefficient at the preferred latencies, it is simply a number that can be quoted and bandied around , but is irrelevant when dealing with the actual end user experience if you cannot realistically use those lowest buffer settings. A perfect example ( and lets remove the 064/128/256 window dressings ) , some interfaces need 9+ ms of playback latency to perform equally to others at 4 ms in respect to number of plugins/polyphony on the benchmarks , this is the reality of the actual overall performance. This has nothing to do with delivered I/O and RTL latency, it is purely the efficiency of the driver evidenced by the fact that it takes more than double the playback latency to deliver equal performance of a better performing driver. Latency performance is more than just input monitoring / live playing. Re RMAA, just have a browse here and here. And see this too. Agree entirely. RTLs alone are just for scoreboarding about being the fastest buffer stuffer. Btw, that Japanese review did remark about getting a lower RTL under USB2 compared with USB3 (just run that URL though the translater too). The reason I'm surprised about that 24-sample setting option being available (even if it proves out to just be unusable window dressing) is because it's smaller than the minimum buffer size specified by the ASIO driver as listed in that Russian review (presumably as queried by RMAA's recently-added ASIO facility). Hey, have you seen MS' info about low latency audio under W10? Thanks, NWAVguy, that's a name I've not seen crop up in a while. Man that was a tough slog, but from what I can make out its more than just the driver, they developed their own proprietary audio specific USB3 controller. Why aren't the other audio manyfacturers all over this like a rash , or maybe some are .. Yes I am across it and have had some lengthy chats about it to my MS liaison , short answer, it won't be replacing ASIO any time soon if ever IMO. Great for replacing ASIO4All in mobile environments sans interface , but don't really see anything past that in the near future. The Zooms have sparked my interest, I am in the process of securing one for testing. Its great to see the Japanese firms assigning time and energy to the area of dedicated audio controllers/drivers for better latency performance, instead of just falling into line with the off the shelf solutions many settle for. Yamaha also developed in-house for the Steinberg UR line , and despite it not being a class leader, it is better than the generics. Lets see where the dust settles on this one..
Not much happening in regards to testing over the last 5 months or so , I will do a new round of testing on the new batch of interfaces released recently when I get them across the bench , but for now just a final follow up post on the Presonus 192. Personally I had hoped to have closed the book on this one and moved on after the initial saga , but the 1.5 and 1.5.1 drivers have delivered a few more curves that need to be highlighted for those reading in and interested in the unit. The above charts list all the numbers from the initial 1.4 driver to 1.5 and 1.5.1. So what exactly are we looking at ? First graph is the reported and delivered I/O and RTL in the Minimal Safety Buffer mode which was manually available on 1.4.*. The second graph ( Consolidated ) is the recommended matched pairings for Safety / Playback buffer , which are now hard set on the 1.5 driver. 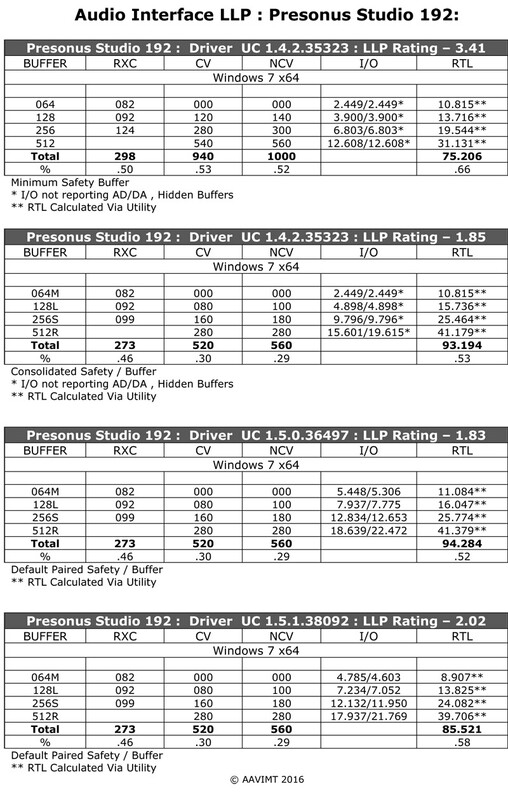 Third graph is the release 1.5 driver , fourth the 1.5.1 driver/firmware with the widely reported lower latency. First thing to note, using the recommended matched pairings measurably increases I/O and RTL on anything above 064 where Minimal Safety is hard set , so 1.5 did not improve I/O and RTL on any of the other settings, it made them measurably higher. The new 1.5.1 driver still has the locked pairings and subsequently has hight I/O and RTL than the initial 1.4 driver on all settings above 064. The matched pairings are supposed to improve inoculation against drop outs due to the overall higher playback latency, well that's the theory. In practice the higher USB kernel block safety buffer is instead collapsing the driver performance once the processing overhead is scaled up on larger sessions. This goes against the theory of higher playback latency lessoning the chance of drop outs, except there is another variable introduced by using very large USB block buffers , which was not tested and accounted for, IMO. In all my testing on the various interfaces using the same OEM driver, the driver is best at the lowest safety buffer setting, across all playback buffers , not under the matched pairings. Why haven't I reported this earlier seeing the 1.5 driver has been out since end of February ? Simply because the performance went backwards and I was way over all of the melodrama over this release and want to remove myself from the ongoing saga over the relevance or non relevance of the driver performance.I held off hoping that the 1.5.1 driver/firmware release would address the issues and return the unlocked pairings to at least have the option to run at some improved latency settings. To say I was disappointed that after 6 months of development and 2 major revisions, that the driver performance went backwards , is an understatement. Those that require efficient low latency performance and can understand the data provided will have their answer , cyclic debates re personal preference and relevance have already been covered. As I clearly stated in an earlier post , latency performance is more than delivered playback latency and RTL, its how efficient the drivers are at the respective working latencies , the charts above are a clear indicator of where the current Presonus driver is heading in that regard. Very disappointing and increasingly frustrating , hopefully this is not going to become a common theme with the manufacturers using these OEM driver. All I can do is point it out if they do. The information re the locked pairings hobbling performance at the expense of higher playback latency was something that I reported to Presonus 6 months ago , but was obviously rejected and dismissed.